so you will get a better idea and understanding of the process. The object of this lesson is not to print the “perfect” apple print as much as the fun of finding the perfect apple, and the adventure of creating. Whether as a simple apple printed alone or to add an interesting layer of mixed media. . . . very simple, few supplies and you can eat the apple when you you are done ONLY if you carefully slice off the layer of gel crayon of course) !! Note: once you have assembled your Bibles, paper and supplies, this project goes faster than the time it will take to read the directions and watch the video. You might consider making a party out of it and gather your friends and their Bibles, everyone watch the video (below) and do their favorite verse together. It is easy enough for the children and artistically challenged to join in as well. 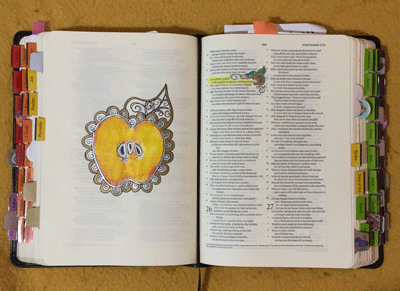 This Apple print is in an ESV Interleave Bible, (every other page is completely BLANK) illustrating Proverbs 25:11. Embellished with Sharpie Metallic Fine Point (Silver, Gold, Bronze). 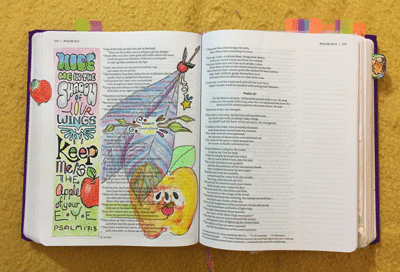 There are multiple verses in the Bible that you can illustrate with an apple print. Different Bible versions are slightly different. Here are just a few. My absolute favorite is Proverbs 25:11 followed by Psalm 17:8. Small apple or apples – I found that small “Golden Delicious” apple had a very pleasing, recognizable “Apple” shape but any apple or crab apple has it’s own possibilities. Faber-Castell Intro to Watercolor with Gelatos – Watercolor for Beginners Kit. Make sure you have a good Red, Yellow, and Green. NOTE: you can use watered down acrylic or watercolor paint but it does not blend as well as the gel crayons. First – ALWAYS – practice any multi-media technique on a piece of paper outside your Bible before you decide the colors you chose don’t go together as well as you had hoped or any number of other issues you may discover. There are a number of brands of Transparent Gel Crayons that gave me results I preferred, however you could use any color medium that makes you happy. 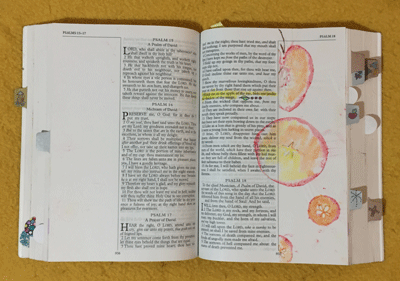 . . A watercolor based marker should work (although I have not tried them), Watercolor or Acrylic paint .. . any water based product you can get on the apple should come off on the paper . . .practice on plain paper before doing a page in your Bible. 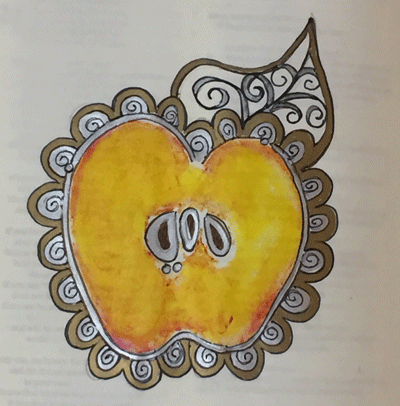 Consider how you plan on embellishing your page before you print the apples. Pencil in the words based on the size of the apple . . . it is easier to change where you are going to print the apple than to have to squeeze your words after the fact. 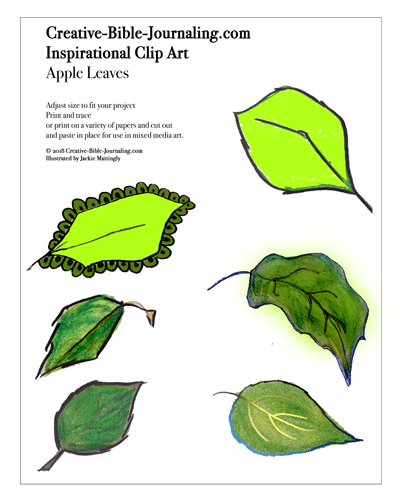 You can use the same apple to make multiple prints, just keep adding additional layers of gel crayon. If the image gets muddy with color, or you have used a color you don’t like, either run water over the apple and dry with a paper towel, or slice a thin layer off the apple to get a fresh surface. Be aware that when you are done, many mediums may not dry immediately. Gel crayon in particular are slightly “sticky” for an extended period of time. 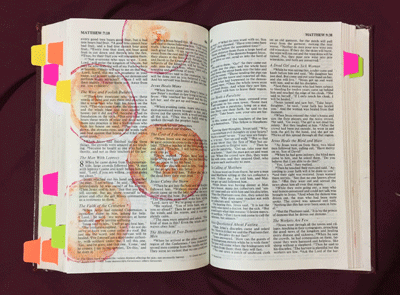 . . with Gel crayons, leave your Bible open over night, then take a paper towel wrapped over your finger and you can lightly “buff” or polish your print to remove excess product. If your apple is particularly dry, when you do your test print, the color may not transfer to the paper as bold as you hoped. You can lightly mist the apple either prior to or after placing the color on the apple, let it set just a minute to let the water dissolve the pigments. To much water will make the pigment run, so get to a happy balance on your test paper before you make a print in your Bible. Pages with apple prints can be further embellished with in-line art to highlight the verses. Please consider ordering your supplies from the Amazon.com links below and watching the youtube.com video through to the end so that the small commission we receive will enable us to continue providing you with with more creative content like this tutorial. If you enjoy this tutorial please leave a comment below, like and share the post, pin, etc. So we know that you would like more of this type of content on our blog. Printed on a fine grade of Watercolor paper this project, whether embellished with a verse or just as an apple print, makes excellent wall art as shown below. 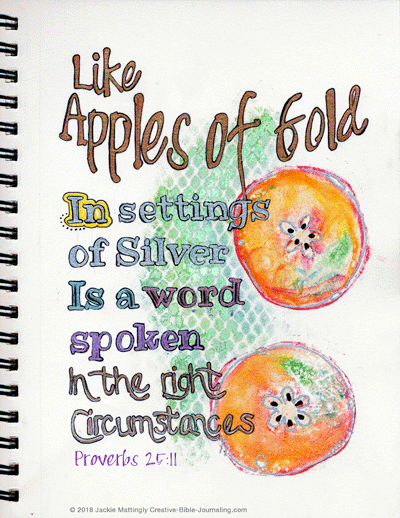 Like Apples of Gold, In settings of Silver, Is a word spoken in the right Circumstances – Proverbs 25:11 – Printed in Bible Journal. This wall art was created in a watercolor paper notebook. The green background was made by laying the bag from some oranges down and using it as a resist while sponging acrylic paint through the bag. I used Crayola Slix Stix as the gel crayons. the lettering was done with metallic Sharpies and outlined with fine line black sharpies. 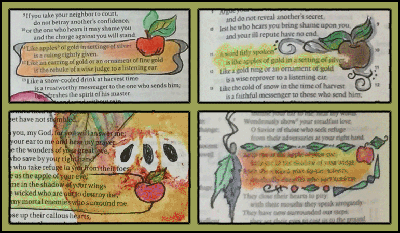 Apple Print illustrating Psalm 17:8 Even though there was Margin Art from a past Apple Tip-In Tuesday Project, and a feather drawn with Prismacolor Pencils, as well as inline art embellishing the verse, this apple print made a fun “extra mixed media layer” to illustrate the verse. Apple Print – Psalm 17:8 – Note the use of different sizes of apples, cut both vertically and horizontally, small red delicious and crab apples. I used a piece of card stock as a resist to make 2 of the apples go behind the column demonstrated in the video below. Embellished with Prismacolor Premiere colored pencils and Sharpie Metallic Fine Point Markers. 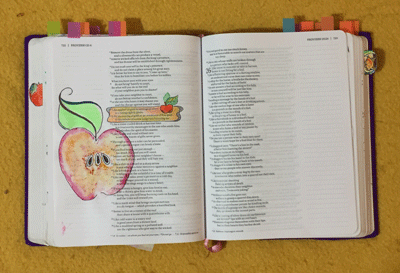 Apple Print – Proverbs 25:11 – without using a marker to outline the apples or add seeds, you can easily read through apple prints that you used gel crayons as the coloring medium. 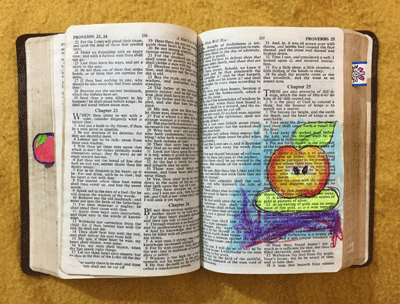 Apple Print – printed with Psalm 17:8 in an Interleaved Bible, verse outlined with Sharpie Metallic Permanent marker and embellished with Prismacolor colored pencils.